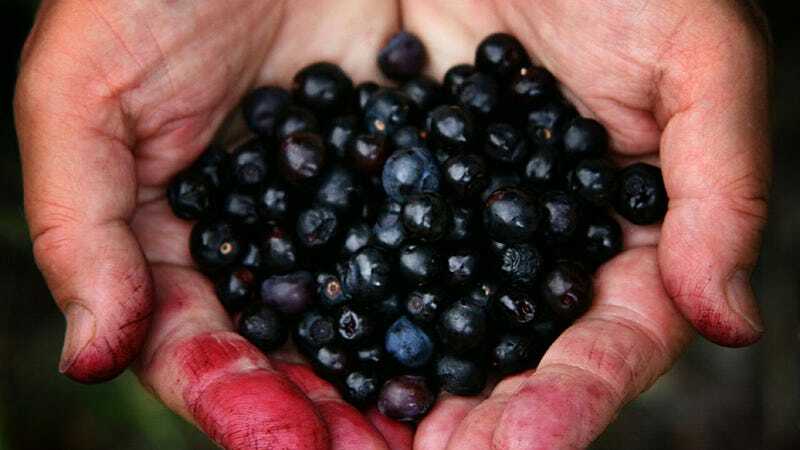 Picking your own food in the wild produces no easier or tastier result than it does with berries. And there's more than you might think out there, both in terms of sheer volume and types. Here's how to find the good ones. Hopefully we all know that there's plants and berries and stuff out there that can kill us. You'll find plenty of guides to identifying poisonous species or even methods for determining if an unknown species is good for you or will kill you. I know very little about which plants are poisonous and don't care to touch my lips to, lick or taste anything suspect, so rather I just study which wild plants exist in the areas through which I travel and familiarize myself with the ones I'd like to eat. No guide on the Internet or in print is going to fully prepare you to identify plants in outdoors, in the real world. A picture cannot capture the scale and perspective and variety of nature. The absolute best way to learn about edibles is to go out there and try some. Feel what the plant feels like, smell what it smells like and touch it to see how it responds. If you want to try a new plant, get an experienced local to show it to you, then try to learn where it grows and when, in what conditions and what other plants may resemble it. It's this familiarity that breeds confidence. But, this is at least a basic guide to what's out there, what it looks like and whether or not it's worth the effort of picking. You'll find wild blueberries across southern Canada, in the Sierra Nevada, Cascades and along the east coast from Maine to North Carolina. They grow on low bushes that spread across the ground in sort of a carpet. I like to eat them straight off that bush, just crawling around in the woods, popping them in my mouth as I find them. If you're less greedy, gather them up and put them in your pancakes. They'll be dark blue, with a white, dusty "frosting" of wax on the outside and ripe flesh is a pale green. They're best from May to August, depending on elevation and climate. My absolute favorite berry of all time, cloudberries grow on the ground in the tundra of northern Canada, Scandinavia and Siberia. The fruit looks like sort of a golden-yellow raspberry and is very tart. You can eat them fresh, where that tartness is something of an acquired taste (I again crawl around hoovering them up), or you can gather them and turn them into a sweetened jam, which is probably a little more palatable for most people. They grow so far north that the plants are only uncovered by snow for a few months a year. Their bright color and round shape is very evident on the green tundra. Found across the eastern United States and the coastal west, picking blackberries is a ritual for children each summer, picking their way through the spiky bramble to collect ripe fruit. You'll know its ripe when it's a nice, even black. Red or white fruits will be sour and gross. Great fresh, or covered with milk and honey. You'll find these wild grapes growing on tree-hanging vines in the south. You squeeze the flesh out of the tough skin and only eat that. Like the best grape you've ever eaten, just full of large seeds. Basically, just look for grape leaves hanging from a tree; the fruit is purple when ripe. Found across the eastern US and at higher elevations out west, huckleberries come in colors from red to blue to black and can be from 5-10mm across when ripe. Due to their variation and resemblance to poisonous varieties, it's especially important to positively ID this fruit as it exists in your region. The taste is often compared to that of a blueberry, but I find them to be quite a bit sweeter. No, this isn't a euphemism for testicles. A little red and white fruit that grows on a waxy green leaf in northern climes, the taste is quite bitter, but bears seem to like them. For that reason, they work best as a pie filling or with similar, sugared preparation. Large clusters of small black berries grow on medium-sized shrubs in western forests, while other varieties in other colors grow everywhere from South America to Europe. The bitter taste isn't very good to eat, but Euros turn them into a cordial, liquor or wine, which is unbearably sweet. These bulbous red or green fruits are said to grow on trees across northern states from Maine to Minnesota, but I've never seen or tasted one, so they must be rare. They're said to taste like sour grapes. Little red partitioned fruits that grow on trees, these have a strong taste, making them most popular in dried form where they're used in teas. Our native red mulberries are under attack from imported Asian white mulberries, which are taking over their habitat and outgrowing the native plant. These are so sour they'll make your mouth pucker, hence the name. They're actually quite tasty and can be eaten raw. You'll find them in eastern swamps. They can be red, black or purple. Very similar to blackberries and raspberries, except the black fruit grows on a low, trailing vine rather than in a dense bramble vine. They're nice and sweet like their cousins too, even if they are a rare sight. A small tree that grows the largest tree fruit native to North America. That fruit is typically two to six inches across and ranges from greenish yellow to brown on the outside, with a yellow flesh studded by large brown seeds. If you can find one, you're in for a treat, it's sort of a cross between a mango and a banana. They crow across eastern states from New York to Georgia and as far west as eastern Texas. These grow in the damp coastal forests of the west coast, from northern California to southern Alaska. Think a raspberry that grows on a tree with a really pretty pink flower. Like a blueberry that grows on a tree, but not quite as sweet. They grow across the west, but a bit of a cult has sprung up around them in Canada, where they're revered for their supposed vitamin and antioxidant-packed health benefits. Looks like a bunch of green grapes, but grows around the caribbean on sand, where grapes don't. They're ripe when the green fruits turn purple. The taste is said to combine sweetness with acidity and they're sometimes fermented into wine or vinegar. You know what a strawberry looks and tastes like; wild varieties are smaller and tastier. They grow across the US and southern Canada, but are a rare sight. If you find a wild one, eat it. They peak in early spring, just after the snow melts and you can spot them from afar by their white flower growing low to the ground. This invader from Europe is now established along both sides of the Canadian border. The berries grow on a thorny shrub, making them hard to gather and the reward may not be worth they effort; they're very sour. High in pectin, they are good for making jam though. You'll find wild raspberries across most of the US and Canada tangled up in thorny brambles. Look for those on the edge of forests, where trees meet grass. They bloom in late spring and produce berries in summer. Try and keep an eye out for the red berries as you're hiking, they're mostly a berry of opportunity. Leave the white ones alone and pull the ones that are a nice, deep red.